Review: Trust no one. 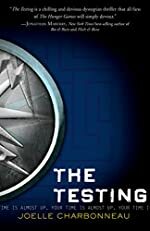 In Joelle Charbonneau's gripping novel, The Testing, readers are taken on an adventure that will capture the attention of Hunger Games followers as well as readers who have embraced The Giver. Set in a future America, The Testing exposes a dystopian society in which the planet has been resorted to a barren land with crumbling buildings and minimal resources for survival. Graduation day, a day when Cia no longer has to wear pink, a day when Cia will join the ranks of adults, a day which will change her life forever. It's been years since a graduate from Five Lakes Colony has been chosen for The Testing, but Cia hopes that this year she will be chosen to follow in her father's footsteps and have her chance to attend The Testing and be admitted into University. Cia however doesn't realize that her dream comes at a great cost. In fact, her dream can become a nightmare. The Testing is not like any other test - it's a test that can literally determine life or death. But once you're chosen, there is no turning back! At first the similarities to The Hunger Games are concerning. It's easy to wonder if The Testing will be able to stand on its own. But although the premise is similar, The Testing is different enough to thoroughly entice readers. Although the character dynamics are well written, it's the plot twists and clever "tests" that will keep readers enthralled all the way to the end. Surprises are found at every corner and when it seems everything is figured out, another plot twist takes readers in a different direction. The dystopian society with references to the infrastructure of today's world also brings enough familiarity to the setting to further draw readers into a world that has been created after the Seven Stages of War. Overall, The Testing is an amazing book that brings trust and loyalty into question making the reader constantly wonder if anyone in The Testing can really be trusted. The Testing is the first book in a series and readers will want to jump right into the second book, The Testing: Independent Study. We would like to thank Houghton Mifflin for providing a copy of The Testing for this review. Have you read The Testing? How would you rate it?